Biography of Greek Sculptor, Late Classical Sculpture: Famous for The Farnese Hercules. of an original sculpture by Lysippos. from the 4th century BCE. Lysippos was one of the greatest sculptors of the Late Classical period of Greek sculpture, along with Skopas (active 395-350 BCE) and Praxiteles (active 375-335 BCE). Official sculptor to Alexander the Great, his work was characterised by lifelike naturalism and slender proportions. Hugely prolific in his time, it is said that he produced over 1500 works, some of which were colossal. As with most artists from this period, no certain originals remain, we only have Roman copies and ancient critical writings to work with. Lysippos is best known for his marble and bronze sculpture of athletes, heroes and Gods. Born in Sicyon around 395 BCE, some accounts say Lysippos was taught in the school of Polykleitos (5th century BCE), while others say he started learning Greek metal work and was self taught in the art of sculpture and bronze casting, and studied the Kanon of Polykleitos himself. Venus de Milo (c.130-100 BCE). Lysippos was particularly innovative when it came to the setting the scale of the male body. His work is characterised by slimmer proportions of the body - he reduced the size of the head and elongated the limbs, which made his figures appear taller and more statuesque. No doubt, this is partly the reason he became a favourite of Alexander the Great. Today, there are so many portraits of Alexander the Great, it is impossible to determine which can be attributed to Lysippos directly, although one good Roman copy (found at Tivoli) may be seen preserved at the Louvre in Paris. Lysippos continued to extend the boundaries of his marble sculpture. There is a new sense of movement in his work, the head, limbs, torso all face in different directions, indicating a sudden change of action. He also took great pains over the hair, eyelids, toenails and other details of his figures. Lysippos received numerous portrait commissions from Alexander's Generals. 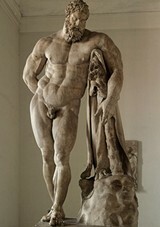 And, as he was also head of the famous athletic school of Peloponnese, Lysippos naturally sculpted many athletes. Most popular at the time as a commission, was a figure of an athlete, scraping his body with a strigil - a curved instrument, used to scrap oil, dirt and sweat from the body. Apoxyomenos (The Scraper) is a known Roman marble copy which can be seen in the Vatican Museum. Roman writers at the time, including Pliny, make many references to Lysippos and his style of sculpting. They comment on the grace and elegance, and the symmetria or coherent balance of his figures. They said he produced new and striking versions of the Gods, including Zeus and the Sun-God. Many of these were colossal figures in bronze. Others works (copies) attributed to him include the Horses of Saint Mark; Eros Stringing the Bow (several copies exist, the best of which can be seen at the British Museum, London); and the Oil Pourer (Dresden). To learn how to judge Greek sculptors like Lysippos, see: How to Appreciate Sculpture. For later works, please see: How to Appreciate Modern Sculpture. Later in his career, Lysippos became head of the school of Argos and Sikyon. His pupil, Chares of Lindos went on to construct the Colossus of Rhodes, one of the Seven Wonders of the Ancient World. Together with Skopas and Praxiteles, Lysippos helped bring about the transition into the Hellenistic period of art. (See also: Greek Architecture.) He remains a key figure in the history of sculpture from classical antiquity.  For more about the evolution of Greek sculpture, see: Homepage.  For information about classical art from Ancient Rome, see: Roman Art.